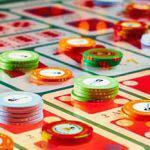 Baccarat is one of the easiest casino games to play. With just three possible bets to make, it’s easy to mix things up and feel good about where you’re choosing to drop your chips. But not all bets are created equal. Did you know that one specific bet comes with the best odds while one other bet should be completely avoided? 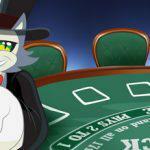 Sign up and play baccarat at CoolCat Online Casino today! Bet on banker’s hand – banker bets have a 1.06% house advantage. 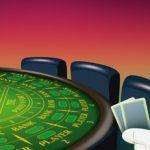 Bet on player’s hand – save the 5% house commission on banker’s bets. Avoid the tie bet – tie bets have a 15.75% house advantage. Baccarat is truly unique. Unlike Blackjack or other card games where you are the player and you vie head to head against the house, in Baccarat you have the option to bet on whether the Player’s hand will win or whether the Banker’s hand will win. Betting on the Banker’s hand is your best bet. That’s because Banker bets have a 1.06% house advantage compared to a Player’s bet which comes with a 1.24% house advantage. Don’t let the 0.22% difference fool you. Even a 0.01% difference is a big deal, especially when you’re playing casino games for real money. When you win by betting on the Banker, the house actually takes a 5% commission. That’s because they need to accommodate for the lower house edge. Chances are you’ll win more frequently on the Banker’s bet, and the house isn’t just going to hand over that extra money blindly. Remember, casinos are in the business to make money, not hand it out willy-nilly. But the thing is casino games are random. So betting on the Player is still a viable option, and one that could yield big results. For that reason, Player bets are definitely worth betting on, especially if you can’t deal with watching the dealer trim a little but off the top of your winnings. 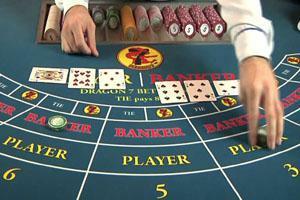 Betting on a tie in Baccarat might seem like a good move. After all, when a tie hits and you bet on one, the payout is pretty sweet. But betting on a tie hand actually comes with a house edge of 15.75%. To put this in perspective, one of the biggest scam bets in Baccarat is Big 6 or 8. Betting on a Place 6,8 comes with a 1.52% house edge, yet betting on Big 6 or 8 moves the house edge up to 9.09%. That’s arguably one of the worst bet in craps, yet it seems like a bargain when you compare it to betting on a tie in Baccarat. If you’re still unsure of whether betting on a tie is worth it, a good rule of thumb to follow is that if a game offers a tie bet, don’t bother. For example, in Casino War, the house has an 18.65% edge for tie bets. We’ve listed the best bets from first to worst, but you should always heed this advice. Betting on a tie is always a bad idea, unless of course you’ve got x-ray vision and no what’s coming next. Assuming you don’t, that leaves two best—betting on a Player and betting on a Banker. We already told you that betting on a Banker is always your best bet, however you might want to ignore this advice if you’re following a Baccarat betting system. If you’re employing a betting strategy system like Martingale, we recommend avoiding the Banker bet completely. While the odds are more in your favor with the Banker’s bet, sticking to this bet could eat into your profits and actually ruin your betting strategy. With Martingale, you’re constantly doubling your bet after a loss. After a series of losses, you’ll actually come out ahead when you finally do win, assuming you manage to do so before you hit the table maximum. But that’s only if you stick to the Player’s bet. If you opt to bet on the Banker, you’re paying the house a commission when you finally win. That commission could actually eat into your profit, which means when you finally do win, you may be looking at a net loss. Had you bet on the Player, you would be ahead in the exact same situation, with the same series of losses. Head to your local casino. If you live in Vegas, you’ll probably find $10 minimums on a weekday, assuming you’re not playing at a high-end casino. If you’re playing at Wynn, Bellagio, or somewhere of equal caliber, those minimums could jump to $25 a hand. Of course, when you win, you’ll win big. But it’s not necessarily the best way to figure out how these Baccarat bets pay off (especially because they don’t always pay off). That brings us to #2. 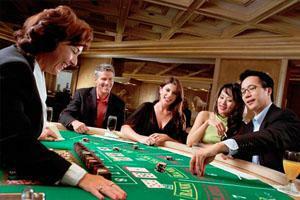 Try playing online casino games. 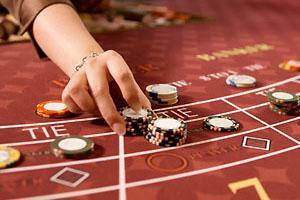 At CoolCat Casino, you can play free Baccarat without having to risk real money. 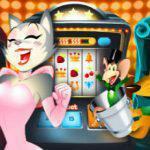 To get started, create an account at CoolCat Casino, sign in, and choose the free option. While you won’t win real money, you also won’t risk real money. But that doesn’t mean you won’t get to play with chips. At the free Baccarat tables, you’ll be given a giant stack of chips. They just happen to have a cash value of $0. By using your free casino chips, you can find out firsthand how much a waste the tie bet is, how lucrative the Banker’s bet is, and how sometimes the Player bet pays off (especially if you’re using a betting strategy). When you’re ready to win real money at CoolCat Online Casino, a simple deposit turns that free casino into a real money casino in a snap. Remember, we have more than just Baccarat. You’ll find all your favorite games, including casino War, so you can discover that all tie bets really are for suckers.